This is a quick guide to getting Korean names right. In Korea, family names are placed before given names. So Park Min Sun was born into a family of Parks. And the name his parents gave him is Min Sun. You could call him Mr. Park if you want to be professional. Or you could call him Min Sun if you are his friend. 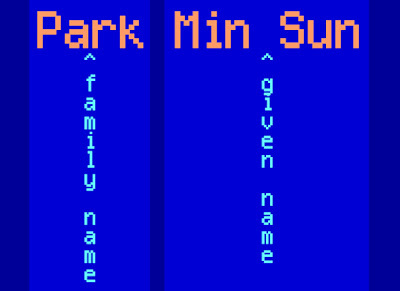 Park is a very common family name, along with Kim and Lee. Nearly all Korean names consist of a one syllable family name followed by a two syllable given name. Examples: Park Min Sun, Hwang Young Sang, Kim Jeong Eun, Wea Hyung Soo. 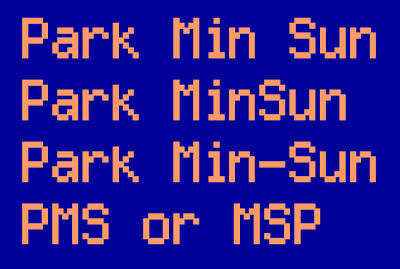 Very rarely will somebody have less syllables in their given name, such as Park Min (not to be confused with Park Min Sun). Just as rare is having more syllables, such as Hong Jemina. Sometimes overseas, names are presented in reverse order. For example, Park Min Sun may be noted as Min Sun Park in another country. However, this isn't always the case. Yes, this can be confusing! A common practice is to choose a nonKorean name for using when interacting with English speakers. Example: Christine Yu. Of course, there are people who create an artist name for themselves. Example: Skitsch. Lastly, never write names in red. It is considered bad luck. You may already know this, but I thought those who didn't might find it useful. Please let me know if you have any questions. As you can see, I've changed MY name (at least my blog name) to better fit me. Thanks for the info on names! Your perspective and ability to communicate information in an interesting way keep learning fun. I'm still waiting for that post on why Korean animation looks like Japanese animation...and why do certain types of animation take on the form they do??? I didn't know how to explain it to my friends but now I can.